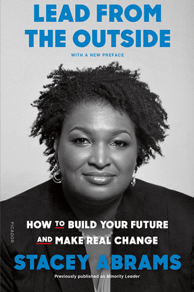 Stacey Abrams who served eleven years in the Georgia House of Representatives, was the 2018 Democratic nominee for Governor of Georgia, where she won more votes than any other Democrat in the state’s history. She delivered a stunning rebuttal to President Trump’s State of the Union address and her name has been floated as a possible 2020 presidential candidate. Her new book,Lead from the Outside, is a handbook for outsiders, written with an eye toward the challenges that hinder women, people of color, the working class, members of the LGBTQ community, and millennials ready to make change.